You can MAKE APPT's ONLINE(Usuall next day slots are available). Our office has a state of the art DIGITAL X-RAY MACHINE on site(in Gainesville office). 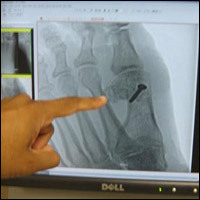 Xrays are immediately viewed on a computer within 5 seconds of taking them. Total xrays 3 views will take less than 2 min. Cost of X-rays at our office is usually less than 1/4 as compared to the hospital. 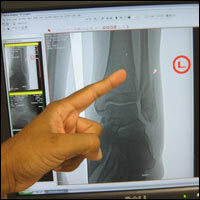 The xrays can be magnified and adjusted for the best view. It is SUPERIOR to plain film xrays. Angles can be drawn automatically on the digital image to better plan surgical procedures. 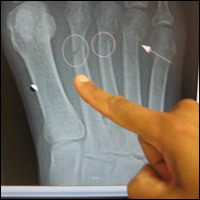 Xray copies can be printed out on paper or CD or even emailed. Our office also has a DIGITAL ULTRASOUND which allows viewing for tendonitis, cysts, and fractures. Dr. Bhakta often uses it to guide injections into pin point areas for maximum effectiveness with less medicine. We are pleased to introduce RADIAL SHOCKWAVE TREATMENTS at our office with new Zimmer en Pulse system. It is used for plantar fasciitis, Achilles Tendonitis, Shin splints, Sesamoiditis and other tendon and soft tissue problems. Most of our Prescription medications are automatically faxed from our ELECTRONIC HEALTH RECORD system to your pharmacy during your visit. It will save you time and reduce medical errors from handwriting mistakes. All our new patient forms are online to speed up your encounter at our office.